The DSV Single valve gate systems utilize a modular design with proven standard components. Features include compact sizing, reliability and easy maintenance. The DSV features pneumatic or hydraulic actuation with nozzle lengths up to 250 mm for small to large shot processing commodity and engineered resins. 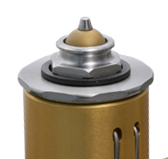 DSV systems utilize the DFQ nozzle design featuring a threaded base which screws directly into the manifold.